Hi Ya'll! My name is Cindy Manion. My spouse is Robert and we are the owners and operators of LONG M RANCH. I was born & raised in Dallas, Texas. Robert was raised in Ohio. 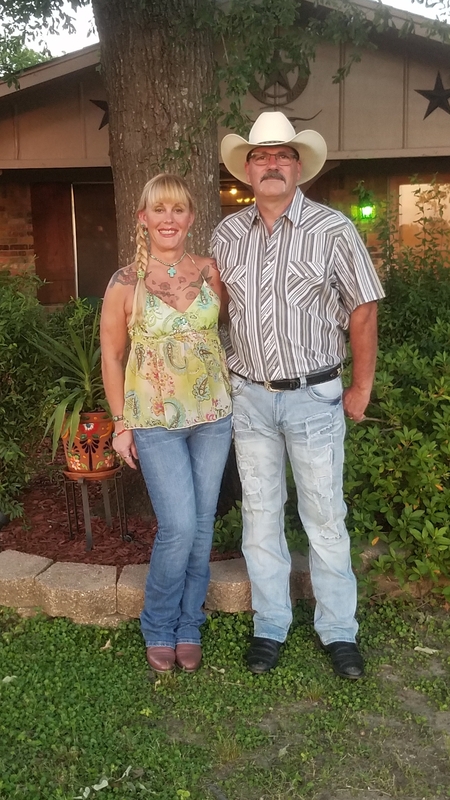 We met in 1994 and were married in 1995, that is when we moved to Wills Point, Tx. We have 4 children. We have 2 boys and 2 girls, with only one still under our roof. Chelsea is a junior at Wills Point High School. All our other children are grown and making their own way in life and careers. We are very proud of their accomplishments. I recently retired, August 2018, from the Dallas Fire Department, where I was a firefighter and paramedic. I worked for DFD for 24 years. Robert is a manager of a company in Dallas. Prior to that he was a manager for a company in Waxahachie, for 27 years. We have been raising cattle since 1995, when we moved to Wills Point. In the beginning we raised commercial beef, Angus and Brangus. A few years ago, I started telling Robert that I wanted a few longhorns, just as pasture ornaments. December 2015, he bought me 1 bull, 2 cows & 2 calves, off of Craigslist. At that time we didn't know anything about longhorns and their bloodlines. We were very fortunate that our 1st five were actually very good bloodlines. The bull was a grandson of BOOMERANG CP and the cows were out of MAX HB, who was out of MAXIMUS ST. We still have those 2 cows in our herd as foundation cows. That bull gave us 90% heifers and we kept plenty of his offspring. We were hooked on Registered Texas Longhorns. Their majestic look, their friendliness, the multitude of colors they come in & the shapes and sizes of their horns.We are a small ranch, with only 50 acres and a few tracts of lease land. We have approximately 30 momma cows, their calves, 3 steers & 1 bull. We started with Angus & Brangus, we only have 5 cows left, that don't have swooping majestic horns. I look out at the pasture and I'm amazed at the beauty. We have truly been blessed, a good marriage, great kids and REGISTERED TEXAS LONGHORNS! I've been fortunate to have met great people that have been in the business a long time and are very knowledgeable. They have patiently answered all my questions. They have sold me heifers, cows and bulls. I have studied bloodlines, articles, magazines and other ranches. All to get our small herd where it can compete with the big herds. We truly love our longhorns. I truly believe our herd is going in the right direction.